The people who “wrote the book” on paper machine clothing, have done it again. AstenJohnson is now accepting orders for the much-requested Second Edition of Paper Machine Clothing. Interested papermakers, managers, engineers, professionals, and students can order the book at the price of US$195 plus shipping. Shipping is free for order quantities of five or more books. For order quantities of ten or more books, shipping is free and the price is reduced 10%. We are now shipping books from our Charleston office. A student discount is offered to full time students at universities affiliated with the pulp and paper industry. Please use the discount code STUDENT and provide your student email address. 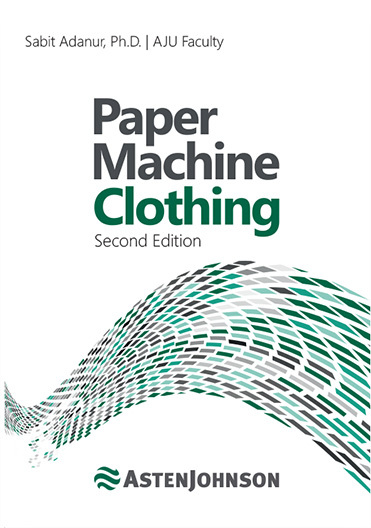 Paper Machine Clothing, which builds on the excellent work in the first edition authored by a former AstenJohnson associate, Dr. Sabit Adanur in 1997, is a hardback 278 page reference resource providing information about key papermaking topics as well as some of the latest technology available in paper machine clothing. Practical guides for troubleshooting and properly applying machine fabrics are included throughout the book. In brief, the book gives an introduction to pulp and papermaking technology and then covers the main processes of Forming, Pressing, and Drying in detail. Design, manufacturing, testing, application, and service of paper machine fabrics for each machine section are explained in detail. The second edition of Paper Machine Clothing draws extensively from the knowledge base and teaching staff of AstenJohnson University™. Thanks to Daryl Wells, Dave Burton, Rex Vass, Butch Yeldell, Derek Chaplin, and Ted Borgerding for their contributions. Special thanks to TAPPI and Fisher International for allowing us to reference their knowledge in this book. Thanks are extended to Ann Iademarco, Janet Parlor, Robert Puhr and Gene Simon for the professional look of the book. Thanks to the team at Forms & Printing Solutions for their assistance in proofing the book.